Ford V8 engine conversions into Bronco IIs, Ranger pickups & Explorers have become very popular. Since pioneering conversions for these vehicles well over 20 years ago, we’ve strived to research every possible problem or difficulty you might encounter when converting your vehicle. The parts we manufacture are available for small block Ford V8s retrofitting stock engines, while keeping the stock transmission or installing a new transmission. Because of the diversity of applications, we do not offer complete conversion packages. We have grouped the conversion components by application. Many of our components are necessary when converting your engine and/or transmission. Items such as exhaust and radiators can be modified or sourced elsewhere. The Rangers & Bronco IIs were first introduced in 1983, and come stock with either a 2.8 V6 or 4 cylinder. They later came equipped with a 2.9L, 3.0L or 4.0L V6 engine. Ford used various transmissions. The manual transmissions consisted of the Toyo Koygo, Mitsubishi or Mazda. These transmissions are all light-duty 4 & 5 speeds. The automatics that Ford used were the C3, C5 and A4LD. The conversion components we manufacture fit all Bronco II & Rangers. Currently, engine conversions using our components have been performed on Ranger pickups as new as 1997. Vehicles 1998 & newer had frame rail and suspension changes in which our components do not fit. (We have had customers that have used our components on trucks as new as 2002 without any issues). In 1991, the Ford Explorer was introduced, retiring the Bronco II models. This vehicle came stock with a 4.0L V6, and the A4LD transmission. The adapters we manufacture fit Explorers 1991-94. Many questions arise when considering any engine swap and/or transmission swap. 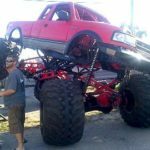 Some of these questions include what year & size block to use, transmission choice, transfer case & axle strength, suspension requirements, body lift, cooling, exhaust, etc. We’ve tried to address as many of these questions as possible. These vehicles utilize most metric fasteners. The engine is from Germany and the transmission is from Japan. Therefore, it is suggested that before you begin your conversion you should obtain the proper metric wrenches to ease the removal and installation of your new engine and transmission. In addition to these tools, you will need an engine hoist and torque wrench, and the capability to drill 1/2″ diameter holes. These conversions can be accomplished without welding or cutting; however, in some cases modifications may be required. We recommend that the individual Ford shop manuals be obtained for torquing and electronic wiring specifications. First check your local Department of Motor Vehicles for smog & engine requirements. Certain states (such as California) require the same year or newer engine as the vehicle. The engine should be complete, retaining all smog equipment. The most recommended engine is the Ford 302. If your engine choice is a 351 Windsor, extra consideration should be given regarding exhaust clearance. A special oil pan must also be purchased. To remove the engine, take off the hood, drain the cooling system and depressurize the A/C system. Next, disconnect all necessary electrical connections and remove the fan shroud, radiator, and fan. Make sure that you label all of the electrical connections to ensure proper identification for the new engine. The next step is to remove the heater hoses, air cleaner, vacuum hoses, throttle cable, and the upper “Y” pipe bolts. It is advised that you label all of your vacuum hoses so that they can be reattached in the correct location. Now, remove the fuel lines and the transmission strut rods and, finally, the motor mount bolts. In some instances, it will be necessary to remove the A/C compressor and the power steering pump; however, in most applications this can be avoided. This procedure for removing the engine will take between two and six hours. The transmission should be removed prior to the removal of the engine. On 4WD vehicles, the original 4 cylinder and V6 engines are supported by a large metal crossmember that provides the necessary engine mount positions. When converting to the new V8 engine, you will eliminate the original engine mounting pads. You will be required to drill two new 1/2″ holes in your crossmember and do a bit of grinding. The instruction sheet for these mounts provides measurements for the new hole locations. Our 4WD engine mounts, PN713018, are a direct connection between the new V8 engine and the existing crossmember. They will position the engine so that no additional oil pan modifications will be required when using the regular Ford dual sump pan. On 2WD vehicles, the original 4 cylinder and V6 engines are supported by a large metal crossmember that provides the necessary engine mount positions. These mounts are designed to fit both body styles of the Ford Ranger 2WD pickups. The mounts are slotted to have some adjustment to the engine position once installed. On the early body style Ranger, the driver’s side mount will require a hole to be drilled in the cradle. Accounting for just a couple of differences, the installation of these mounts into both the early and late model Rangers are basically the same. Rangers 1992 & earlier require a 1/2” hole to be drilled into the stock engine cradle for the installation of our mounts. It also requires the fuel filter to be relocated. The fuel filter is located inside the driver’s side frame rail. The fuel filter must be relocated to allow for proper exhaust clearance. On both body styles of the Rangers, we recommend doing a “dry run” on the engine installation. The mounts should be installed loosely into the Ranger engine cradle. Lower the block into position on top of the new mounts and adjust the block to the furthest forward location allowed by the slots in the mounts. Adjust the block so that it sets level from side-to-side. This first trial run will allow you to mark the air box on the passenger side of the vehicle for proper clearance. The driver’s side firewall will also require a slight amount of clearance (a small dent in the firewall to obtain valve cover and head clearance). Remove the engine and perform the necessary modifications to the air box and the firewall. Our engine mounts are PN713015A. The Ford V8 engine rubbers mounts are Part No. E4TZ-6038G, or AA PN713017. Your vehicle is equipped with one of three different rear axles Ford used. Up to 1984, Ford used a 6.75 rear axle. This axle is marginal up against a V8. Vehicles 1985 to 1989 used a 7.5 rear end, and vehicles 1990 & newer used a 8.8 rear end. These axles are usually sufficient to handle the power of a V8. Something to consider is tire size. If a large tire size is going to be used and the V8 is a high horsepower application, you might consider having a custom rear end built. There are two different belt systems used on Ford V8s; either a “V” belt or a Serpentine. The water pumps must have the fluid exit on the driver’s side if you are planning to use our radiator. Most water pumps have this configuration. The Serpentine pumps are a reverse rotation water pump. The stock belt system must be retained on this water pump. Either pump can be used with a new engine swap; however, we have found that you can obtain more engine clearance with the “V” belt system. On vehicles requiring additional water pump clearance, Ford Motor Sport offers a short version “V” belt & Serpentine water pump. The “V” belt water pump, Part No. M-8501-E351, is 1.5” shorter than stock. This water pump requires an aluminum 3-piece pulley, Part No. M-8509-P (2 grove). The Serpentine water pump is Part No. M-8501-A50. This water pump is 1.750” shorter than stock and requires one of the following aluminum pulleys: M-8509-L (steel) or M-8509-M (aluminum). The kit includes the pulley for the water pump, a crankshaft & alternator. These pumps are not legal on pollution-controlled vehicles. Ford Motor Sport can be reached at Tel# (810)468-1356. Your vehicle is equipped with a standard 2 core radiator. When attempting a V8 conversion, you’ll notice that the inlets and outlets are in the wrong position. It’s possible to modify your existing radiator by switching the tanks and relocating the inlet and outlet; however, we have found that, in most instances, this still does not provide adequate cooling for even the mildest V8 engine. We have had a few customers try a Ford Explorer V8 radiator, but have never heard any feed back on how it worked. We recommend that you consider one of two options. We manufacture a 4 core copper/brass radiator to help prevent any cooling problems. This radiator comes complete with hoses and remote filler neck. We also have our Rad-A-Kool aluminum 2 core radiator (with transmission cooler). Both of these radiators can be installed while retaining the air conditioning condenser in the stock location; however, for the best fan clearance, the condenser can be moved forward and the radiator tucked under the grille. You will also need to use a new A/C condenser. We recommend a Universal condenser that is 5/8″ thick. Both radiators fit 2WD and 4WD vehicles. Both radiators measure 16” H x 21.5” W x 3” D.
If your Bronco II, Ranger or Explorer is equipped with air conditioning, the air conditioning condenser will have to be relocated in front of the radiator as far forward as possible. This will allow for additional fan clearance. The radiator support and grille may need to be modified for additional room. An aftermarket tubular grille is a handy way to free-up extra room in front of the radiator. The factory air conditioner compressor may be used; however, brackets to mount it onto the V8 will have to be fabricated. When using an injected 302 engine, the engine intake interferes with the A/C plenum. The hose connections must be modified and the wiring extended to reach the new compressor location. A new 5/8” thick universal condenser from Modine can help make additional clearance. This optional A/C Condenser is Modine Model No. 1K500001. On most conversions, you will be able to retain a stock mechanical fan. We have been told that a fan off of a Ford Falcon works well. With your engine in the correct location, you will have a 1/2″ to 1-1/2″ of clearance between the fan and radiator. If a mechanic fan is used, a shroud should be fabricated to properly draw air through the radiator. This is also a safety precaution. We have encountered some vehicles with variations that require the use of an electric fan. If an electric fan is used, most V8 engines require a minimum of 950 CFM. We recommend using two 12″ electric fans to provide adequate cooling. Most electric fans come complete with a fan shroud. Your stock V6 alternator can be retained by using the correct V8 pulley, alternator bracket, and adjuster. If you are replacing a 4 cylinder engine, we recommend that you purchase a new V8 alternator to provide the correct amperage. You will be able to utilize your stock power steering pump by using the correct brackets. These brackets can be found on most Ford passenger cars from 1978-86. In addition to this, you will need to obtain the correct V8 pulley for proper belt alignment. The hoses can be retained in the original length on most conversions. (Carbureted) – In most cases, a mechanical fuel pump will interfere with the steering box and frame rails. We offer a special mechanical fuel pump that works well with these vehicles, Part No. 716052. This fuel pump is manufactured with the diaphragm above the arm to allow additional clearance to the steering box. This fuel pump cannot be used on vehicles that are using the Serpentine belt with the air conditioning and power steering systems. If your vehicle was originally equipped with electronic fuel injection, you will have a fuel pump in your gas tank. This fuel pump has a 40 psi rating and will not work with a normal carbureted engine without the use of a regulator. This regulator must reduce the psi to between 5 and 7 pounds. If a regulator is not available, then you can also use an in-line fuel pump. If an in-line fuel pump is used, then the fuel pump in the fuel tank should be removed. (Injected) – Since most injected blocks require a high pressure fuel line, the stock fuel pump (inside the fuel tank) is usually adequate. You will be required to use a remote oil filter adapter when attempting this conversion. This adapter is available from us under PN716084. You cannot complete your conversion without this part. The kit comes complete with hoses, bypass adapter plate, and remote oil filter mounting bracket. The remote mounting bracket can be installed on the fender apron. This kit will provide the clearance on the steering sector and the chassis. This special remote adapter has the inlets at a 90 degree angle. Not all remote oil filter adapters can be used on these vehicles because the fittings normally protrude straight out off the block adapter. We have had several cases where customers purchased other bypass oil filter adapters only to find that the fitting locations are not compatible with the engine conversion installation. We only offer the block-off adapter and remote oil filter mounting plate as a kit. No items in this kit are sold separately. Advance Adapters uses the Perma-Cool brand name. When converting to a V8, you can use the stock V6 temperature and pressure gauge sending units. These units will be compatible with your new V8 engine and stock gauges. If your vehicle is equipped with a factory tachometer, you will need to have it re-calibrated for use with your new engine. The Ford V8 requires that the starter motor be bolted to the bellhousing. For this reason, it is imperative that you check your flywheel and starter for proper engagement before installing the engine into your vehicle. Ford bellhousings are normally matched to Ford flywheel diameters. (A bellhousing designed for 164 tooth flywheel cannot be used with a 157 tooth flywheel). The wrong flywheel will result in the inability to find a matching starter. For the most part, manual transmission conversions will use a 164 tooth flywheel, while automatic conversions will use a 157 tooth flexplate. 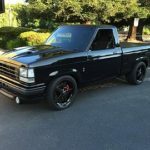 The original Bronco II starter will not be retained. There is a special dual sump oil pan required for all 2WD & 4WD V8 conversions. This pan is available from your local Ford dealer and must be ordered to match your particular year of engine. The oil pan must be purchased complete with a new pickup tube and screen for the V8 installation. This pan is a standard Ford part and is found on most 1980 & newer 302 motors. If your engine is an older style that has the dipstick entry into the side of the pan, then you will need to modify your new pan for use with your older engine. This will require some welding. It is required that you use a 164 tooth flywheel for manual transmission conversions. In order to use the late model Ford F150 truck bellhousing on manual stock transmission installations, you must use the 164 tooth flywheel. This flywheel cannot be changed since the bellhousing requires the starter location in a position compatible with only the larger flywheel. On late model 302 blocks (1982 & newer), Ford did not offer a 164 tooth flywheel. An early year flywheel can be used, but the flywheel must be balanced to this block. This can be performed by most engine rebuilders. For automatic transmission installations, we recommend that the 157 tooth flexplate be used in order to allow for additional clearances and minimize tunnel area modifications. Use great caution in selecting the proper flexplate. 1982 & newer late model engines will require a counter balance. Make sure to test fit your starter motor, bellhousing, and flywheel assembly before proceeding with the engine installation. Your Ford vehicle is equipped with an electronic ignition and computer control module. It is best advised to avoid using this system with your new motor. If you are going to retain a computer controlled engine, then we recommend obtaining the Ford schematics. The easiest installation for computerized V8 engine installations is to use the Street & Performance wiring harness or the Ford Motorsports wire harness. Ford Motorsports offers a wiring harness for the aftermarket engine conversion industry. This wiring harness is easy to install and is perfect for 4WD engine conversions and kit cars. There are many other manufacturers of Ford aftermarket wiring harnesses. We have found the Internet to be a good source in finding additional manufacturers other than the ones we have listed above. 4WD Vehicle Headers: The installation of a V8 engine can create exhaust clearance problems. On 4WD vehicles that are not retaining smog equipment, we offer exhaust headers that fit these close quarters, PN717044. This header is designed with 1-1/2” primary tubes that dump into a 2-1/2“ secondary. The header system uses exhaust clamps to fasten to the new exhaust system to maximize clearance. We manufacture a header to fit into 2WD Rangers. PN717044A and PN717044A-NP are custom headers designed for our engine mounting system. When installing a V8 with our headers, the passenger side header is a tight fit. If the transmission you are using has the larger bellhousing to fit the 164 tooth flywheel, the bellhousing will require modifications for header clearance. We recommend that you set the passenger header alongside the frame rail before setting the engine into the engine compartment. The driver’s side header can be installed once the engine is in the proper location. Once the engine is installed and leveled, bolt both headers to the block and check clearances. This header design is new to our product line. The headers will only fit with our new style 2WD mounts (PN713015A). This header uses 1-1/2” primary tubes that exit out of the engine compartment into a 2-1/2” collector, the collector uses exhaust clamps to fasten to the new exhaust system to maximize clearance. The headers listed above are not smog legal. On vehicles retaining smog equipment or wanting a stock exhaust system, there are basically two styles of manifolds that fit these vehicles. The Ford Explorer manifolds fit well and provide the correct emission controls for smog in most vehicles. For vehicles not concerned about smog, the stock manifolds from a Ford Maverick, Comet, or ‘79 1/2 ton Ford truck work well. The photos below show one other stock cast iron Ford manifolds that also fit well; however, the vehicles that these stock Ford manifolds were off of is not known. Note: The exhaust manifolds from a Mustang will not work. If a 351W block is used, exhaust manifolds, or our headers cause steering interference. Our kits do not require the use of a body lift; however, it is worth considering. A body lift will provide additional clearance to the heater box / air conditioner plenum, while at the same time provide more clearance around the bellhousing and usually eliminate any other type of clearance problems. The installation of a V8 is about 175 lbs. heavier then the stock engine. 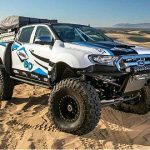 On 2WD applications, the suspension will normally drop about 1 inch. We recommend using a heavy-duty shock that will compensate for this drop. On 4WD applications, the suspension is equipped to handle the extra weight. Once completing any one of these vehicles, the front alignment should be checked. 1. The body seam between the floor pan and the firewall will need to be bent over. In some instances, additional clearance may be needed in the bottom corners where the firewall meets the floor pan. 2. The heater box on the firewall needs to be trimmed and patched to clear the valve cover. This modification is approximately 5” x 7”. We recommend that you pop-rivet & epoxy a new piece of sheet metal over the hole. 3. If you are using a fuel injected block, you will also run into interference with the air conditioning plenum on the engine air intake. On these installations, the plenum must be modified. The average conversion time on most vehicles is approximately 40-50 hours. On some Ford stock transmissions, we have listed a transmission identification code. This number is found on the driver’s side door of your vehicle. C5: The C5 was used in Ranger / Bronco II vehicles 1983-84. It has the same dimensions as the C4. If you have the C5, you simply need to change your bellhousing, torque converter, and valve body from a C5 V8 application. This is to prevent having to bother with the computer module. Failure to change these parts will cause the torque converter to lock up. Some customers have told us that it is cheaper to obtain a C4 transmission and install the C5 tailhousing & output shaft into the C4. Either one of these options work well. The original shift column linkage can be retained with some slight modifications. C3: The C3 is identified by a “V” transmission code. The overall length of this transmission is 24”. We do not offer any adapters to retain this transmission. If your vehicle has this transmission, you will need to select one of the Ford transmissions that we offer transfer case adapters for. A4LD: The A4LD is identified by a “T” transmission code. The overall length of this transmission is 28.687”. We do not offer any adapters to retain this transmission. If your vehicle has this transmission, you will need to select one of the Ford transmissions that we offer transfer case adapters for. The following transmissions are all stock 4 & 5 speeds that Bronco II and Ranger vehicles might have been equipped with. These transmissions are considered light-duty. We offer an adapter plate to fit most of these transmissions to a standard Ford bellhousing. We’ve had customers experienced both good & bad results when retaining the stock manual transmission. Some considerations, with regard to engine size, tire size, and driving habits should be addressed when retaining these stock manual transmissions. Toyo Koygo 4 speed: Transmission code “X”, with an O.A.L. of 24”. We offer a bellhousing adapter to retain this transmission. Toyo Koygo 5 speed: Transmission code “5”, with an O.A.L. of 25.937”. We offer a bellhousing adapter to retain this transmission. Mitsubishi 5 speed: Transmission code “D”, with an O.A.L. of 28.687”. We offer adapters to retain this transmission. Mazda 5 speed: This transmission can normally be found in late model vehicles 1988 & newer. The bellhousing and transmission are integral (one piece). We do not offer any adapters to retain this transmission. Since many of the stock automatic transmissions can not be retained, and some stock manual 4 & 5 speeds are marginal up against a V8, we manufacture several transmission-to-transfer case adapters. These adapters are designed around transmissions that were originally coupled to a Ford V8 engine, alleviating the need for a bellhousing adapter. Most of these adapters will allow you to retain your stock transfer case in its original location, thus eliminating the need for driveshaft modifications. These transmission upgrades kits are based around good, reliable Ford transmissions capable of handling V8 horsepower and torque. Bronco IIs, Rangers & Explorers used three different transmission assembly lengths between the stock manual & automatic transmissions. Most of the adapters that we manufacture will give you 2 or 3 adapter options to directly replace your existing transmission. Some of the new transmission assembly lengths are not exactly the same overall length as stock, but the driveshaft and crossmember will normally compensate for this. We recommend that you measure your existing transmission assembly and compare this measurement to the adapters below. All of these adapter housings are drilled to utilize the factory rubber crossmember mount. Full Size Ford 4WD transmissions: Ford full size 4WD trucks always used the same configuration on the stock transfer case adapter. Whether the stock transfer case was a NP205, NP203, NP208 or Borg Warner 1356, the back end of the stock transmission with the stock adapter housing always looked the same. 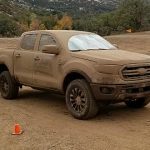 The two kits listed below utilize the factory Ford adapter to couple any Ford 4WD transmission to the Ranger, Bronco II & Explorer 1350 transfer case. These Ford transmissions had either a 28 or 31 spline output shaft. 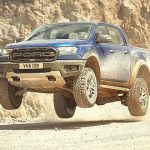 Due to the various Ford transmission lengths, driveshaft and crossmember modifications are normally required. These kits include a spud shaft that couples the stock transmission output shaft to the 25 spline transfer case, the adapter housing, and the necessary hardware. The castings have provisions for the stock transfer case linkage. Modifications will be necessary on this linkage for proper fit. P/N 50-4501 – Ford 4WD transmission 28 spline to Borg Warner 1350 T/C. Adapter length of 4”. P/N 50-4502 – Ford 4WD transmission 31 spline to Borg Warner 1350 T/C. Adapter length of 4”. The Bronco II, Ranger & Explorer vehicles use a Borg Warner 1350 style transfer case. The transfer case has a 25 spline input sleeve, thus requiring a transmission to have a 25 spline output shaft. When bolting a transmission up to this transfer case, the output shaft of the transmission assembly should extend approximately 3/16″ beyond the face of the transmission adapter housing. This transfer case has been manufactured in both a manual shift and an electric shift style. The adapters we offer are compatible with both styles transfer case shifter linkages. We provide the necessary mounting holes in relatively the same location on all of our adapters. In some cases, slight modifications to the mounting brackets and/or shifter handles are required. Most conversions are designed so that relocation of the transfer case can be avoided. On most adapters, the stock crossmember will normally fit in its original location. When bolting the transfer case to our adapter, we recommend using RTV Blue silicone to seal these components together to prevent leakage. 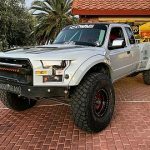 On 4WD conversions, we have designed most transfer case adapters in two-to-three various adapter lengths. By selecting the correct adapter length the new transmission assembly can, in most cases, directly interchange with the original automatic or manual transmission. This will eliminate any modifications to the transfer case location, crossmember mount, shifter linkage or driveshafts. Although this is the most recent information being provided by Advance Adapters, there is information that no longer shows. Some of this information includes the option of the GM 700R4, and more information on manual transmission swaps. The kit includes the adapter plate, bellhousing index retainer, pilot bushing & necessary hardware. This adapter plate bolts to the front of the stock manual transmission. This allows a standard Ford V8 bellhousing to be mounted to your stock transmission. When using the original transmission, it is best to obtain a late model (1984-87) Fl50 bellhousing. This bellhousing utilizes an external slave cylinder that works well with the Bronco II & Ranger master cylinder. This bellhousing was only used with the 164 tooth flywheel. This will cause problems with tunnel clearance. A body lift is normally recommended. The 4 or 5 speed transmission will need slight modifications to the input shaft pilot tip, clutch splines & stock release bearing retainer. These modifications are noted on the instruction sheet provided in this kit. *Other Ford bellhousings can be used, but you will need to fabricate a slave cylinder bracket. These stock transmissions all utilize the same length & spline count on the input shaft. If you are using the F150 bellhousing, the following Centerforce clutch components work well on this application. The General Motors 700R-4 has a case length of 23-3/8″. Our bellhousing adapter is designed to fit the 700R case that was previously connected to the 2.8L V6. Part No. 712592 comes with the bellhousing adapter plate, torque converter adapter ring, crank bushing, necessary hardware, and the instructions to wire the neutral safety switch and perform the necessary vehicle modifications. The exhaust requires some modifications, and you will be required to install a torque converter lockup kit and a TV kickdown cable. The TV cable and bracket for this application are available from Bowtie Overdrive (Tel# 760-947-5240). This adapter can be used for either a 2WD or 4WD vehicle. When using this kit in conjunction with P/N 50-8410, no driveshaft modifications should be necessary. If you are using this kit for a 2WD vehicle or 4WD application that does not use the stock transfer case, driveshaft modification will more than likely be necessary. Ford full size 4WD trucks always used the same configuration on the stock transfer case adapter. Whether the stock transfer case was a NP205, NP203, NP208 or Borg Warner 1356 etc., the back end of the stock transmission with the stock adapter housing always looked the same. 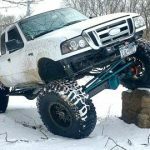 The two kits listed below utilize the factory Ford adapter to couple any Ford 4WD transmission to the Ranger, Bronco II & Explorer 1350 transfer case. These Ford transmissions had either a 28 or 31 spline output shaft. Due to the various Ford transmission lengths, driveshaft & crossmember modifications are normally required. These kits include a spud shaft that couples the stock transmission output shaft to the 25 spline transfer case, the adapter housing, and the necessary hardware. The castings have provisions for the stock transfer case linkage. Modifications will be necessary on this linkage for proper fit. P/N 50-4502 – Ford 4WD transmission 31 spline to Borg Warner 1350 T/C. Adapter length of 4″. This transmission is 15-1/8″ long (with a 7″ bellhousing). This transmission was used in Mustangs until 1995. When purchasing a T5 transmission or bellhousing from a Mustang, be aware that the 1994-95 T5 transmission input shaft is 5/8″ longer than a 1984-93 transmission. The Mustang T5 clutch mechanism is cable operated, whereas the Bronco 11 / Ranger clutch mechanism is hydraulic. A new hydraulic slave cylinder will need to be obtained and fabricated to fit this bellhousing. These two kits include a new Borg Warner T5 output shaft, adapter housing and a new l7% overdrive gear. Also included is a spud shaft coupling the Borg Warner output shaft to the 25 spline transfer case, a custom adapter housing, and necessary hardware. Provisions for your stock transfer case shifter linkage have been provided on this custom housing. When installing this linkage, modifications are required. P/N 50-1802 – T5 to Borg Warner 1350 T/C. Adapter length of 4-1/2″. P/N 50-1803 – T5 to Borg Warner 1350 T/C. Adapter length of 6-1/2″. P/N 27-1004 – T4 transmission assembly to Borg Warner 1350 T/C. Transmission O.A.L. of 26-3/4″. P/N 27-1005 – T4 transmission assembly to Borg Warner 1350 T/C. Transmission O.A.L. of 28-1/2″. In recent years, we’ve had numerous customers with complaints regarding their stock transmission. Using the same transmission and T/C adapters for T5 V8 conversions, we now manufacture an adapter plate to retain the stock 2.9L 6 cylinder. This adapter plate bolts to the front of the T4/T5 transmission. This adapter plate bolts to a Ford 2.9L bellhousing and uses an internal release bearing, Ford# FlTZ7A-564A. (Some applications may require the purchase of this release bearing.) Bellhousing modifications are required. This package should only be used with a 2.9L engine. Refer to Pages 27-29 for additional T5 information.